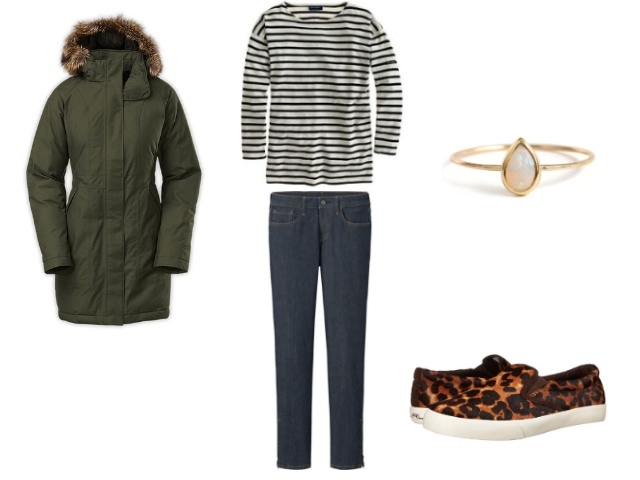 Invincible Summer: Planning for Fall/Winter: A Five-Piece French Wardrobe(ish)? Planning for Fall/Winter: A Five-Piece French Wardrobe(ish)? I've mentioned before that I have trouble sticking to rules when it comes to my clothing and accessories shopping. I didn't end up succeeding with my initial "shopping fast" plan in any real way, and while I've mentioned an interest in taking on more of a "Five-Piece French Wardrobe" approach in a few of my comments on other blogs, I don't think I can perfectly adhere to those rules either. I will almost inevitably see at least a handful of things a season that will end up being impulse buys. That being said, I think the general spirit of the approach works well for someone with my preferences, constraints, and overall closet situation: I have plenty of clothes for my needs, I'm trying to buy less stuff overall, and I do have a deep-set desire for buying nicer "investment" pieces while still sticking to my budget. To that end, I have five items that I will be in the market for in the next few months, and I'm hoping that I won't do too much extra shopping on top of that. I am also feeling a bit of an inspiration deficit when it comes to clothes for Fall/Winter. From my inspiration board on Pinterest, it seems as if my tastes are evolving towards a more minimalist aesthetic, with an emphasis on wardrobe "basics." Breton striped shirt: I have a similar top, but I'm hoping for one with a more classic look. I just put in an order for the J. Crew Factory one that Franish recommended. It's backordered, so I probably won't be able make a decision on it until October. I plan to be fairly picky about this item, and I might be willing to go up to the St. James price point, if needed. Jeans: My only pair of blue jeans is quite worn out from several years of wear and is likely to rip or develop holes in the next few months. Because I will only be able to wear jeans on weekends for the forseeable future, the designer denim price point is not for me. I will most likely be going back to Uniqlo for my replacement pair of basic straight-leg or skinny jeans. Leopard print slip-on sneakers: After experimenting with my striped Keds, I find that I like the casual slip-on sneaker silhouette. I've seen a few stylish people out and about with leopard print slip-ons, and I would like some of my own. Because these are also weekend-only items, I don't want to splurge too much. Perhaps this style? Down coat: I've been using the same random down coat from Amazon for three years now, and while it still adequately meets my needs, there are a few major flows. First, the hood just won't stay up, and my face and head are never as warm or dry as they could be. Second, fabric gets stuck in the zipper if I am careless when zipping it up, which happens about four to six times a season now. I've taken to keeping an old chapstick in the pocket, which helps with getting unstuck. While the coat could well last another year or more, but for this issue, I would not be surprised if, at some point (possibly soon, possibly not-so-soon), the zipper gets permanently stuck, such that I have no choice but to cut myself out. Canada Goose is probably the down coat brand in NYC, but that's not in my price range. The most likely candidates are the Columbia Apres Arson or the Northface Arctic Down pictured above. Dainty ring: This is something that I could easily swap out for another more practical item. I like the idea of having a small ring for everyday wear, but this is one of those purchases that's easy to put off in favor of something more useful. I have a few other items that I am looking for in a more long-term way, including a trench coat and possibly a leather jacket. For those items, I think I'm likely to be so picky that I probably won't be buying either during this calendar year. I'm also generally in the market for sheath dresses for work. While I have a substantial enough number of those, a lot of them are "good enough" type items that have a small issue or two. If I happen to try on anything in my price range that I think is fantastic, I will make room in my budget for it.